In this Thai basil chicken recipe, you’ll learn to cook an authentic Thai street version of the dish. 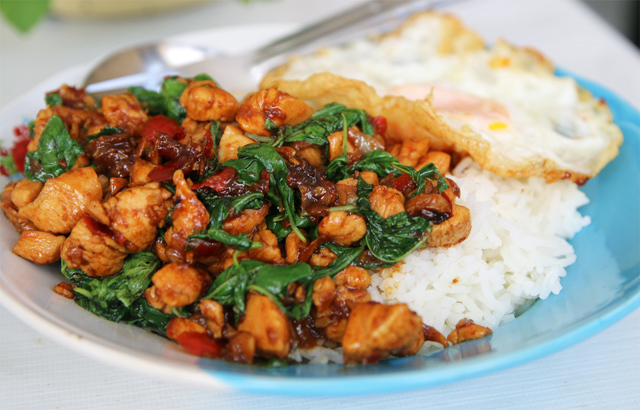 Thai basil chicken, better known in Thai as pad kra pao gai (ผัดกระเพราไก่ pad ka prao gai), is a contender for the most popular, and the most beloved Thai street food dish of all time. You know sometimes when you go to a restaurant and you have no idea what to order, or even what you want to eat? 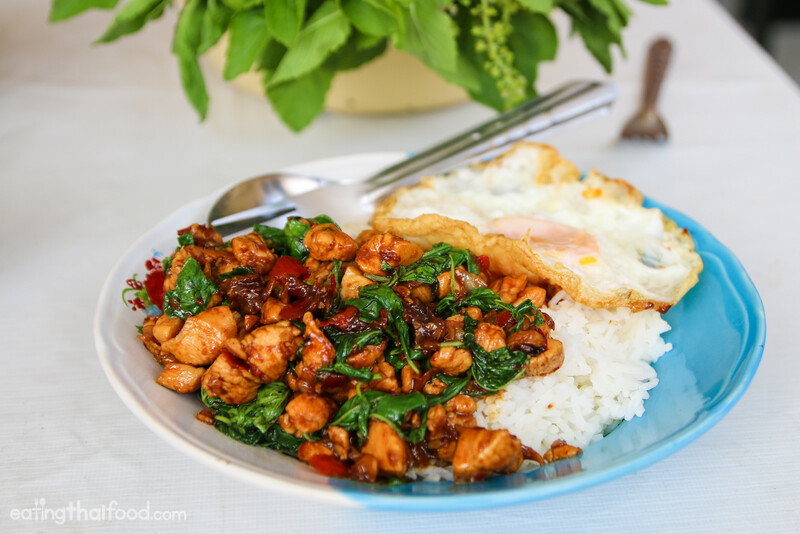 When that happens in Thailand, pad kra pao gai (ผัดกระเพราไก่, with chicken), or any type of meat stir fried with Thai holy basil, is a dish that comes to the rescue! You can make your pad see ew with chicken, pork, squid, shrimp, or even tofu, but this time I’ll be making this Thai basil recipes with chicken. However, feel free to substitute chicken with whatever meat you want. Note: To see the exact steps for making this Thai basil chicken recipe, scroll down below to the recipe box, or keep reading for more of an explanation of this amazing Thai dish and an in-depth look into some of the ingredients. There are three main types of basil used in Thai cooking: Thai sweet basil (ใบโหระพา bai horapa – this one is often just referred to as Thai basil), lemon basil (ใบแมงลัก bai maenglak), and holy basil (ใบกะเพรา bai kra prao). This Thai basil chicken recipes uses holy basil (ใบกะเพรา). But, can I use Thai sweet basil for this recipe? Unfortunately it can be challenging to find holy basil outside of Thailand, and I’ve found that Thai restaurants in the United States often substitute Thai sweet basil for Thai holy basil and call it basil chicken. However, sweet basil doesn’t have the vibrant peppery flavor that holy basil has, and so to get this dish to taste the way it tastes in Thailand, you really can’t substitute another type of basil for holy basil. 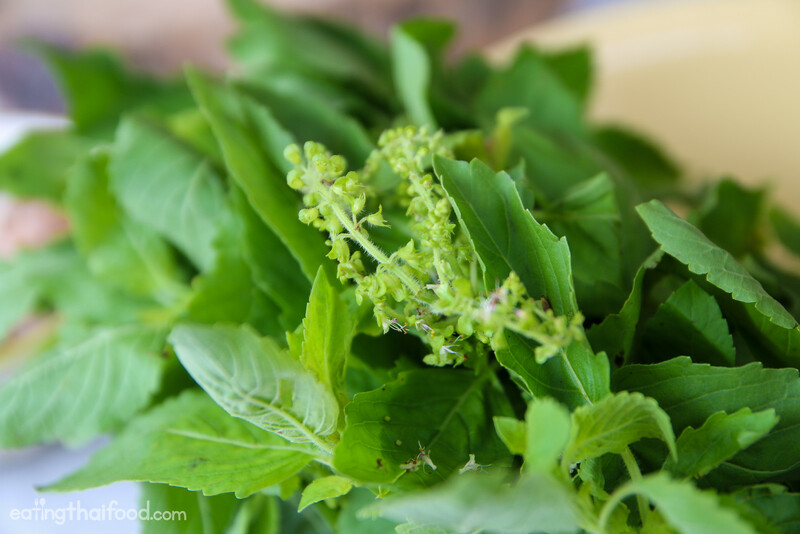 But if you simply cannot find holy basil (you could grow some yourself) and can only find Thai sweet basil, you can still make this recipe, and though it won’t have that peppery flavor, it will still probably taste good. For a little reassurance, on my latest visit to the United States, one day at the Asian supermarket I came across a big box of holy basil, I think grown in California – so it can be found in the US. Can you see all the oils from the garlic and chilies? Another way you can really elevate the flavor of this Thai basil chicken recipe is by using a mortar and pestle to hand grind your garlic and chilies. A garlic press would also do the job well. Unlike mincing, grinding really releases all the juices and oils of the chilies and garlic and it brings out an extra depth of flavor, which in return makes the entire dish of chicken basil more vibrant, garlicky and spicy. You don’t need to crush the garlic and chilies down to a curry paste, but you’re just looking for just a coarse crush, like in the photo above. But no worries if you don’t have a mortar and pestle, mincing is still adequate. Before getting started on this Thai basil chicken recipe, often my very first step is to begin by cooking a pot of rice. That way it’s finished and freshly cooked as soon as the chicken and egg are ready. The first step is to fry the egg. Thai fried eggs are more like deep fried eggs, cooked in lots of oil. The extra oil gives them a lovely crispiness on the outside edges, and they taste so incredibly good mixed with the rice and chicken. After the egg is finished cooking, lay it aside and get started cooking the chicken. Finally, just like all of my Thai recipes, the ingredients listed (and the quantities) are a guide – it’s what I used – but use it loosely as a guide. Thai food is made to taste the way you want it to. Recipe size: 1 plate meal, and to be honest, it tastes best when cooked in a single portion. You could multiply this recipe a few times to make enough for a few people at once, or you could make individual portions. Eat it with: Pad kra pao gai (ผัดกระเพราไก่) is normally eaten on top of a pile of plain steamed jasmine rice with a fried egg on the side. 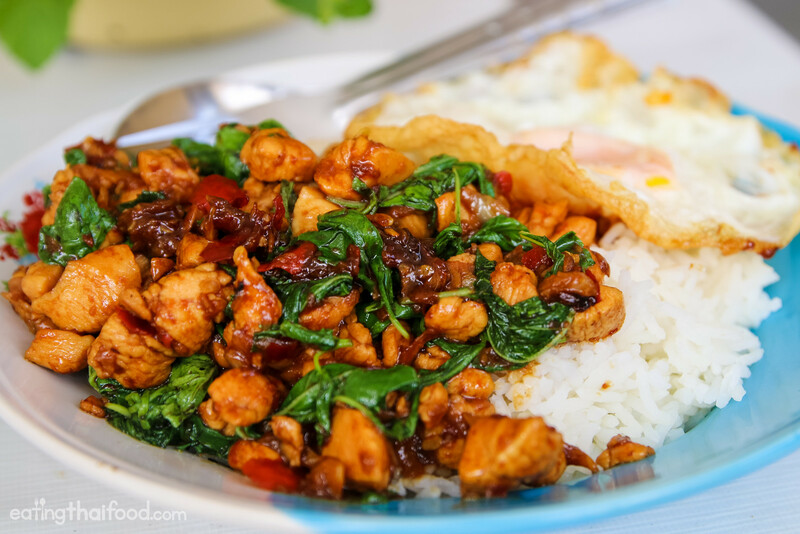 This Thai basil chicken recipe (pad kra pao gai ผัดกระเพราไก่) is a true classic. It's one of the most popular Thai street food dishes. 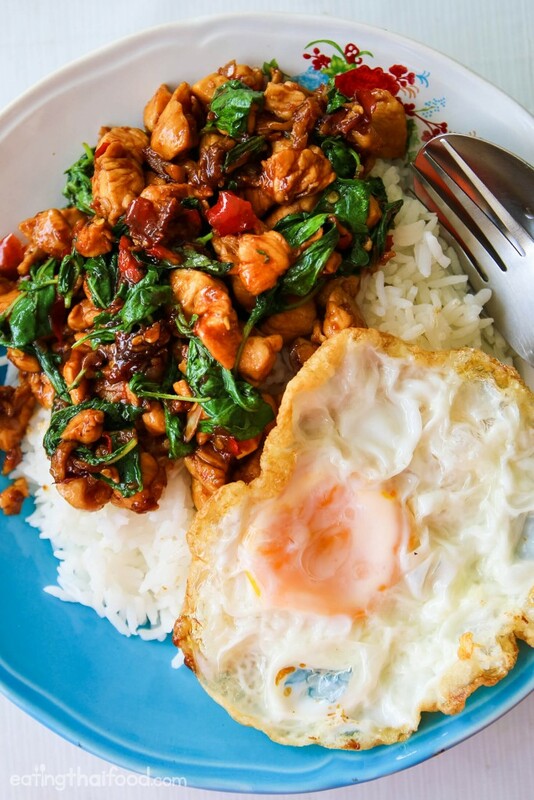 The chicken is stir fried with Thai holy basil, and served on top of rice with a fried egg on the side. After the egg looks about right to your cooked likeness (I like mine runny), take it out, drain the excess oil, and put it on a plate for later. Make sure your rice is cooked and ready to be served before you start cooking... believe me on this one, because there's nothing more disappointing than finishing a pan of pad kra pao gai (ผัดกระเพราไก่) only to realize your rice isn't cooked yet! You’ve got to have the fried egg on the side! 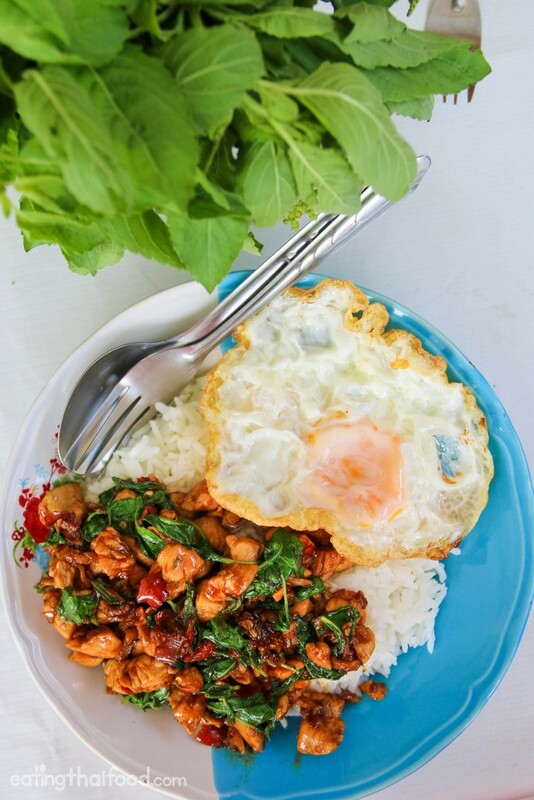 Dish out a plate of freshly steamed jasmine rice, scoop the hot Thai basil chicken (pad kra pao gai ผัดกระเพราไก่) onto one side of your rice, and nestle your fried egg on the other side of the plate. And there you have one of the most widely loved Thai street food dishes in Thailand. Try this recipe out, let me know if you have any questions or comments below, and if you enjoyed this recipes, I would really appreciate it if you would share this with a friend you know who loves Thai food as well – thank you! 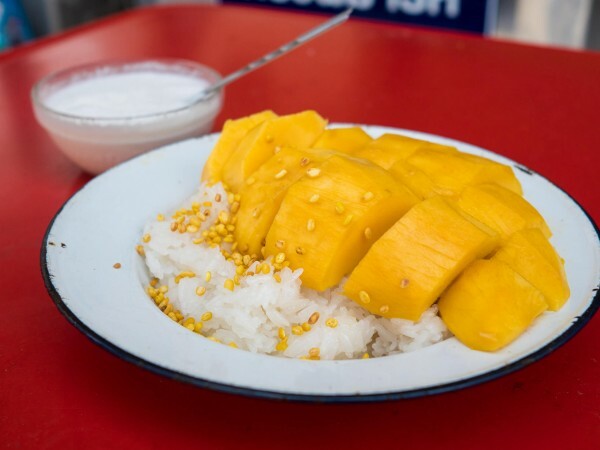 Thai Mango Sticky Rice Recipe: Authentic Thai Street Food Style! 406 comments. I'd love to hear from you! Thanks for sharing this recipe. While enjoying our dishes, our mouths were soon on fire and I hurriedly made some Thai iced teas. In my opinion, you can only eat this with a Thai iced tea… or something equally sweet and milky. Anyhow, this recipe worked out very well for us. I made dinner for my husband and myself, and just simply doubled the portions and it worked perfectly! Thank you again!!! Made your sticky rice…very easy and good. I used moose meat (I live in Alaska) of beef in the Thai beef basil recipe and it was great. Now need some ideas for halibut? Hi Mark love your YouTube channel. Can I substitute coriander for the basil. Difficult to get holy basil here in SA. 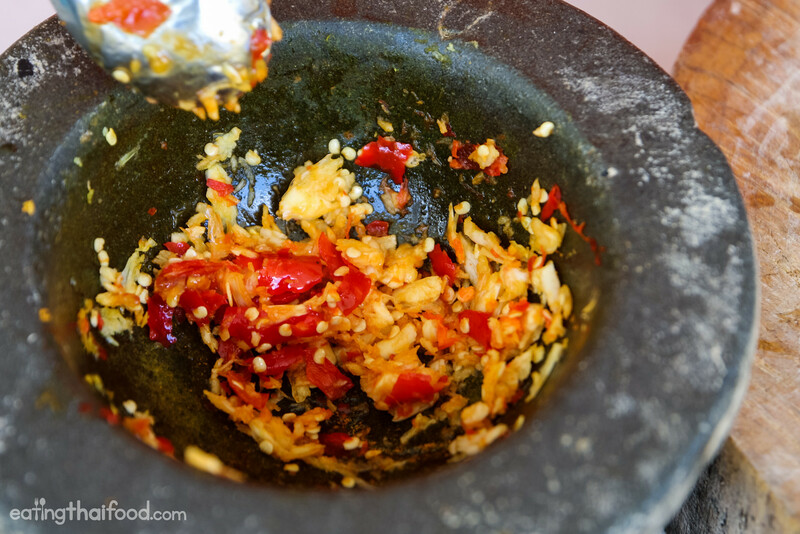 I fell in love with this dish while in Thailand, and the locals loved that I added extra peppers to it. All it needed was an ice cold cola. Now that I’m back home in Michigan, it’s tough finding basil in February, much less Thai basil. Mike, depending on what part of Michigan you’re in, try 168 Market at 14 & DeQuinder in Madison Heights, behind Oakland Mall. Asian market that virtually carries everything , except kaffir. My son found this gem, prepare to be amazed. Hi, nice recipe. Fish sauce is really common for this recipe ordinarily ? Just wondering how many calories in this dish ? If I want to add bell pepper & string bean, would I add them before or after the chicken? I plan to make this for a dinner club group. At our local Thai restaurants they use ground chicken and also add shrimp. Could this recipe be adapted using those ingredients? Good to hear from you Marilyn, yes you can definitely use your meat of choice. Minced chicken or shrimp are both delicious. Enjoy! Awesome to hear that Alina, glad you enjoyed it! Pakistan was truly a trip of a lifetime, really enjoyed the food and people. Thank you! Thanks for letting me know about the Pakistan trip! I traveled in Pakistan in the 90’s and loved it. The food and the scenery where incredible.And such generous and welcoming people. 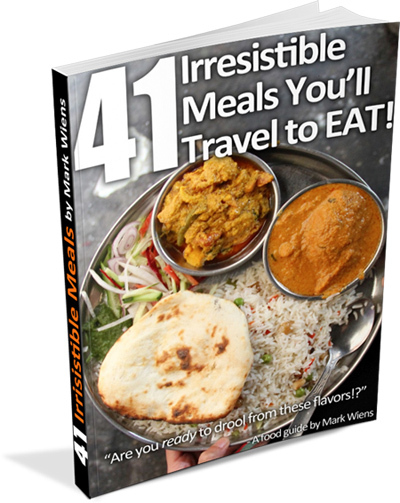 Oh my gosh, Mark i didn’t even know you author a cooking blog! I am an avid youtube fan. I will definitely make this recipe , you made it look so simple and easy to make, perfect for our everyday meals. Thank You! Hey Kristine, thank you very much. Hoping to be more consistent about it now! a few drop of fish oil will make it better! Thanks for the input Sarah. I made this and it was restaurant flavor and quality. Great recipe! For some reason the link to this page shows error 404. This is not a complaint, Love your uploads. As you are a veteran of YouTube, I cannot sign in to join in chats. I have never posted rude or inappropriate comments. Any suggestions? Pad krapow is a savory dish. Sugar in this recipe is not needed. In our local moo baan one shophouse restaurant she puts sugar in the pad krapow and it’s horrible. Wife makes it without sugar. Thais are getting into really bad sugar addiction, especially here in Chon Buri. ”Chon Buri gin wan” is very true. Just try it without the sugar, the oyster sauce is sweet enough. BTW, apart from the sugar, nice recipe, wife’s away so I made it just now for breakfast. I made this and the flavor is awesome. highly recommend it. I need to find a source for the thai basil. i bought mine at whole foods and it was quite pricey. i guess i should try to grow my own hard to trust sources on internet but my city doesn’t have a high concentration of Asian population like Boston or NYC. But Thai food is so good I’m willing to become a basil farmer to eat it! haha. But for sure try this recipe, its well worth it. I made this for dinner tonight and it is excellent. I made coconut rice to accompany it and both together were phenomenal. I’m grateful to have stumbled upon this site and will be looking for more recipes to try! Great recipe! My colleagues love it! Wow it’s a winner. I used tempeh, green beans and cauliflower instead of meat and it was wonderful. Thanks! I’ve made this recipe several times now and my family and I absolutely love it. I’ve substituted fish sauce in place of oyster sauce a few times when I’ve been low on oyster sauce. We have grown our own Thai Basil from seed for the past several years for this recipe and for a few other curries as well. Thanks so much! I have a question: is Thai holy basil different from regular holy basil. Holy basil grows in my garden like a weed (it reseeds and comes up all over the place every year), but it isn’t a specific variety. I’m making this tonight and cannot wait! I’m slowly introducing my fiancé to Thai food, which I LOVE! I made a version of this but used chickpeas instead of chicken. OMG so good! Thanks for showing how to make the egg– that’s the crowning glory! Just made this dish ,exactly to recipie and was absolutely delicious!!!! Paired it with fried rice from same website and it was all so tasty !! Thank you so much and looking forward to trying other recipies from this website ! Score !! Nice-i really like your recipes. They’re beautifully simple and a good learning resource for authentic food ideas to play around with! Great recipe, with a great presentation. Thank you very much. I look forward to more recipes from you. We have been to Thailand a number of times and love the cuisine. My husband and I Thai food and found this soooo delicious! You’re right, the egg totally makes it! Thai holy basil this time, just fresh basil. It was still excellent. Will look for the holy Thai basil next time. Great to hear that Kacey, glad it turned out well. well I want to try what the soccer team that got rescued from the cave wanted as their first meal! Wow! You just got me drooling…that will be the next thai dish I whip up. Wholesomeness in a plate…what more could one ask for! Thank you. Awesome to hear that Jessica! Thank you for the well written recipe. I noticed you put pad see ew in your first paragraph after the listed ingredients instead of pad kra pao, just in case you wanted to amend that. Thanks very much again! MY DAUGHTER LOVES THIS DISH AND ASKED ME TO MAKE IT FOR HER BIRTHDAY. GOOD TASTING GLUTEN -FREE OYSTER SAUCE. I’d suggest just using fish sauce, a little sugar, and maybe a teaspoon of corn starch mixed together. It won’t taste quite the same, but I imagine it would be close. The nice Thai lady at my Asian grocery told me that light soy sauce and fish sauce are the same thing, so I used fish sauce. Great flavors, although only used two red Thai chilies and found this overpowering. Next time will use 1/2 a chili. Perhaps I am using the wrong chili because 4-10 would not have been edible? Otherwise great flavor and my Asian grocery here in south Florida does sometimes have fresh Holy Basil, so will make this again. Light soy and fish sauce are not even close to the same thing. You might want to question how nice your Thai lady friend is. Not edible for you, but delicious for someone who likes spicy food. Percfect flavour! Easy to make ! And the smell…. is like being in thailand again ! Thanks!! Thank you for the detail notes and tips!! You made it easy enough to understand for a rookie cook to follow. I cant want to test it out tonight! THANK YOU!! hi Mark, so this today is the 5th time I’ve made this kra pao gai. it seriously gets better every time as I tweak the chilli or garlic up and down…I’m half Thai living in London and your food brings me back to being small and eating all that goodness! Thank you very much to you and ying’ s mum. I hope you’ll continue to add to this collection. it should be in a book and sold, I’d pay for it! I made this tonight and it was outstanding! We love Thai food and finding recipe’s like this one is such a treat! Thank you so much for sharing and for linking to the sauces. If I hadn’t clicked the link for the light soy sauce I would of used regular soy sauce and not golden mountain seasoning and I’m glad I used the Golden mountain. This also was the first time I’ve ever deep fried an egg… OMG I am in love with it! Re your notes on not using sweet basil– correct, it alone won’t work at all. However, I now live in the Upper Midwest where Thai restaurants are scarce and miss real thai food like crazy. I tried ordering dried thai basil and soon ran out. I tried growing it, no luck, but vietnamese cinnamon basil did do well one year, and it worke great in the dishes– not the same taste, but very good. That gave me an idea on how to use sweet basil to substitute for Thai/Holy basil. Just use sweet basil with some cinnamon and anise or fennel. It works great for my starved palate. This may suit other people’s tastes and budget-it does for me big time– but I recommend always trying the recipe with the real thing first. :). Not that it’ll help in February but I’m from SE Michigan. Found Thai basil plants last spring at Home Depot. Dug up in early fall and growing in my Florida room. Another idea, was at a Vietnamese restaurant recently that several Thai basil leaves on the side with their Pho. Took remainder home and put stems in water and covered with clear plastic. Lasted about 6 weeks. Where is the fish sauce? Super simple….and super tasty recipe…!!! I made it today relished every bite!!! OMG this was divine. Tasted just like the restaurant version. I can’t wait to try more of the recipes.. seriously impressed! I left the egg out. Made this for lunch and it was great. Really easy to make and only a few ingredients. Will be having a gain. This recipe is completely authentic, the flavours are spot on and I’m transported back to Thailand every time I use this recipe. I double the sauce though because it tastes so good on my rice and add some vegetables like bell pepper or onions for extra nutrition. I could easily eat this every day for the rest of my life! Alanna, thanks for writing! Yes that is an awesome practice, sounds great. Yum! This turned out so delicious! Thank you so much! I served the basil chicken with yellow curry rice. I used Serrano peppers instead of Thai Chili’s. I served a cabbage, edamame, bean sprout, scallion, cilantro, carrot and bell peppers with red chilli flakes and peanuts chopped salad with a ginger peanut butter, oyster sauce, soy sauce, rice vinegar, and honey salad dressing. One of the best dinners I ever made. Thank you for the delicious dinner recipe! Great recipe. I live in regiinal australia – its hard to find any thai basil. I used regular green basil and still tasted great. Also used palm sugar and a touch of cornflour at the end to coat the sauce on the chicken. Definitely will make again. Every time I am looking for a Thai recipe, I end up your page, and now know that your recipes are exactly to my taste, what I remember it should taste like and authentic. Thanks! This recipe was GREAT! I am an expat living in Thailand, so I have to learn how to cook with locally grown produce and meat. It’s very different, but I’m enjoying it. We tried this dish today, and it was just as good as the pad kra pao we get in Thai restaurants here. What is it like as an expat living there? How expensive is it? Your receipt is very good. Traditional taste. I will try others soon. Tried it and turned out excellent. In Japan (yes I know, not Thai), making this with ground pork is the most common Thai Dish in Japan. I spent 2 weeks in Thailand recently (Krabi, Chiang Mai, Bangkok) and the pork version was everywhere. I’m surprised it’s not more common in the USA. I’d choose it over the chicken version every time. So amazing – my boyfriend requests this as least twice a week lol. To make it easier, I use 16 oz ground chicken, x6 of all the sauce ingredients, and use cayenne pepper when I don’t have thai chilies readily available. Still so delicious. Thanks for a great recipe! Great! Best thai stir fry I’ve made at home. Others have always been lacking. I also would use ground chicken. I would add 2 or 3 teaspoons of Thai or Asian fish sauce. Hi, thanks for sharing this. I found it really simple to make and totally delicious! Thanks again. I’ve cooked this recipe several times in varying portion sizes and despite my efforts and following the instructions to a T, I am not getting desirable results. The chicken is never the color as pictured and the taste is rather bland. I end up adding chilli paste just to make it edible really, which is driving me nuts as I see so many favorable reviews. It may have to do with how high your flame is. If it is too low and you add your liquid too early, chicken will boil and not caramelize. btw…why cant i rate 3 stars…wtf? Did you click the links for the sauces to make sure you are using the correct ones? I made it once without doing that and it didn’t taste right, but after giving it a second go after clicking the links by the sauces and getting the correct sauces it’s fantastic! Very nice. I use about 1 tablespoon of everything instead of a teaspoon.. otherwise I find it to be a bit tame. I also add Thai red onion. Delicious! Made it loved it will make it again. I too could live on this stuff. WOW talk about good!!!!! Just tried this last night. I did not have Thai chilis or dark soy sauce. I just used regular low sodium soy, oyster sauce, and Sambal Oelek fresh ground chili paste, regular basil from my garden, lots of crushed garlic, Siracha sauce, and a bit of sugar. I also added red bell pepper, green onion, and green beans. I eyeballed the measurements. And it turned out pretty good! Tasted very similar to Pad Prik King. I was surprised by how simple it was. I would definitely make this again. Next time I would add a bit more sugar. I Would’ve paid for my dish, it was so easy and tasty… the best homemade food ‘gasm’ I’ve had in a longtime! Holy Thai Basil, this was Aroy!!! Is it ok to use a pre-ground Chili Paste with Sweet Basil Leaves (the one in a green bottle)? If yes, then how many tablespoons for this recipe? I used Sambal Oelek ground fresh chili paste, since I could only find Mexican chilis at the local supermarket. It turned out really good! I made a larger amount and added a lot of veggies, and I think I put in about 4 teaspoons. But with the ground chili paste you can adjust it according to how hot you like it. I’d put in a few teaspoons when cooking it. If you like it hotter, you can always spoon some more in after you cook it. I dont know thai holy basil. But in Indonesia as I know, basil we called Daun Kemangi. Or someone who knows more about basik in Indonesia please kindly tell me.. Your Thai chicken basil recipe was excellent! The flavors were just right! Simple, easy and quick…. looks delicious! Thank you for the recipe! I followed everything except that I used chicken drumsticks meat instead of chicken breast, and it is yummy! It is a great suggestion to mince the garlic and chilli. Thanks again! Is thai holy basil the same as purple basil, what I call tulsi? Yes, tulsi is the same as Thai holy basil, bai krapow. It is also the same as Ethiopian baso bela, which you can find fried in Ethiopian shops. Gratitude to you and your Thai family for all the beautiful recipes. I recently had param chicken in a restaurant and would like to be albe to make it at home. Can you present that recipe here?? Thanks again! Thank you very much Ginger, will try to look that up! Thanks so much for the recipe. I tried it minus the holy basil! but it still tasted great! Great to hear that Patricia, thank you! Thanks so much for the recipe. I tried it minus the holy basil! but it still tasted great! I tried to send you a message on the contact me site but couldnt. I would love to get hold of an authentic red curry paste recipe. I bought the lonely planet book ‘THAILAND’ from the Source. Which you published with Austin Bush. In it it calls for red curry paste but no recipe for same. If you have it and dont mind sharing please. Hey Patricia, thank you very much, here’s my recipe for red curry paste: https://www.eatingthaifood.com/thai-red-curry-paste-recipe/ Hope you enjoy it! Can I pre cook the chicken except for the fresh basil? Thanks for that awesome recipe. I live in Vienna, Austria, and there is a small Thai eatery where I am used to eating it. Now I’ll be able to reproduce it. Thanks and keep up the good work! I totally make a B-line for this dish whenever I am in Thailand…I always ask them to make it Thai style and it blows your head off…. but it is sooooo good! I will give this a bash at home! This was absolutely delicious and incredibly easy! Looking forward to trying out more of your recipes. Thank you so much!! Thanks Rimmy, awesome to hear that is turned out so well! Man, you are sick!!! I had your Thai fried rice today (used chicken) and ( forgot to buy Thai chillies so subbed some red curry paste about 1 minute before adding the rice). The fried rice was AMAZING!!! Felt like it was what I ordered from Bangkok Cuisine in Forest Hills Queens. I’ve had A LOT of Thai food. Your recipe is a 10! Loooovvvvveeed it. Husband LOVED it!!! Hey Mark I’ve been following your videos for over 2 years now and am super excited about eatingthaifood. Keep up the great work. Absolutely love all the authentic recipes you’re making. Simple and so tasty I can taste it through the laptop! Your wife, mum in law and baby are gems and keeps your work so real. Would love it if you can advise us where to purchase cookware in Thailand (BKK preferably) should we visit. So simple…This kind of puts a stop to my search of this recipe. I’m going to combine it with Chinese style Hakka noodles!! Awesome to hear that, that sounds like it will work well together. Enjoy! Excellent!! Best thai basil chicken recipe ever and I have tried at least 20! I doubled the sauce ingredients and used 3 chilies only. I am level 2 spice at a thai restaurant and that worked well for my palate. Enjoy!! Awesome dish Mark, looking forward to the real deal in Bangkok soon! I LOVE THIS DISH BUT WITH MINCED PORK. Hey Matt, awesome to hear that, minced pork goes so well with this dish! Restaurant quality and it was done in 30 minutes!!! I am in LOVE! Can’t wait to impress guests with my “skills”! They don’t need to know it was this easy! Wonderful meal. Thank you!! Awesome to hear that Laura, glad you enjoyed it! Right down my alley… can’t wait to try it! Great to hear that Belen, hope you enjoy it! Hi Mark!! Big fan of yours as I lived in Thailand as well and fell in love with the food there!! I also enjoy watching all your vids on youtube. I’ve followed a few of your recipes which turned out great! Do you have many Issan recipes?? Have you ever thought of taking a trip up there to taste some of the local favorites?? Maybe somewhere near Ubon Ratchathani! I think that would be really interesting and I would love to try some of the local recipes (the true Thai food in my opinion)…..
Hey Ryan, great to hear from you, thank you very much. I have all the recipes on this page here https://www.eatingthaifood.com/thai-recipes/. I haven’t covered too many Isaan recipes yet, but I plan to do more. I’m planning to do more traveling (and eating) around Thailand soon! Hey Donna, awesome to hear that and thank you for sharing. Glad you enjoyed it! Hey Donna, that’s great to hear, glad you all enjoyed it! Cool to hear that, thanks Jay! Very cool to hear that, thank you Jay! i miss that padkapao. thanks for the recipe. ill be giving a try tonight. Will also be making your version of this, a favourite dish. Thanks Clare, let me know how it turns out! Seriously delicious! I subbed fresh Vietnamese mint and standard basil in place of the holy basil (didn’t have any). Thanks from New Zealand! Glad you enjoyed it Richard, thanks! I love you show, me and my husband meet you and your wife, and your mother at Asian grocery store. at (Arizona) and your all recipe are so good, I try to cook your dish Wow! yummy. good work. Hi Mimi, thank you very much, it was great to meet you in Arizona! Love this recipe. Made it with a bunch of veggies – its tastes so amazing! Better than my favourite Thai place. And surprisingly straightforward. Thank you so much! Hi Kira, that’s great news, glad you like it! I’m Tobi . A chef from Cologne / Germany . I travel a lot and I’m really happy about your blog . I tried many spots from Bangkok – krabi – lampang – ………. NEHM,….please tell me your personal opinion..,,. Perhaps you and your wife want to join me ? Or we check out together the new soei – I was yesterday /it was great . Hi Tobi, good to hear from you, thanks for your kind words. Glad you were able to eat at the new location of Soei. I have actually never been to Nahm, so I’m not sure how it is. Thanks for the invitation, I’m not sure if we’ll be able to join you as my wife and I have some plans, but will let you know. Just discovered this recipe as another dish to prepare for the family tonight! Thx for all the inspiration and your efforts to travel for food! Hey Carl, you’re welcome, I’m so happy to hear this. Enjoy the cooking and the food! Looks yummy, but do you have just the recipe for your thai basil sauce? ? Hi in your recipe for pad see ew what brand of dark soy sauce and light soy sauce you recommend? I could see in the picture you have healthy boy and golden dragon ( isn’t this the ‘seasoning sauce) – however wasn’t clear which is light which is dark soy? Ah! My husband and I just devoured this dish. It was awesome. Thanks so much for the recipe…can’t wait to try more! Great to hear that Jennette, glad you enjoyed it! I made this recipe twice already, it’s just awesome. I didn’t have oyster sauce, so just added some extra soy sauce, and it turned out really tasty! Thanks for sharing Mark! Just tried this recipe and I have to say – wow. The flavours are spot-on amazing and the dish was incredibly simple to throw together! This is truly a winner of a recipe. On a related note, I’m really glad that I was able to find holy basil here in Kuala Lumpur. I don’t think the dish would have tasted quite the same without it. Khob khun mak mak krap for the recipe Mark! I can’t wait to try this dish. What can I do to make more sauce to mix with the rice. Our favorite authentic Thai restaurant will be closing after 35 years family getting too old to run. We always get their chicken with pepper paste and another fav is pork with Thai basil but both dishes have quite a bit of sauce to eat with rice. You are the expert any ideas. Thank you so much! if i try this with shrimp, should i cut it into small pieces like the chicken? Just made this recipe on our wok-a-que, and it was fantastic. Thanks. Looking forward to trying to replicate. Nothing beats the real place and ambiance but recreating a little Thailand is a reminder of a great people, culture and their food. Hey Gerald, yah definitely, the ambiance plays such a big part in the eating experience. Hope you can get some holy basil! Thanks Tessie, hope you can try it soon! Hey David, awesome to hear that, thanks for sharing! Very good recipe . I used thai basil and tastes very good. This is not true taste of this dish , but it is really good. Just made this dish. Used Thai Basil and Mint both from my garden. Couldn’t find any Thai Bird chilis so used a couple of red Fresnos but they were just not spicy enough so I kicked it up with some Sambal Oelek. Came out perfectly. Great dish. Thanks. Hi Mike, loved your recipe. The strange thing is that the numerous times I have had this in Bkk, the meat has invariably been minced, usually in the hotel coffee shops, I might add!! Have stayed at the Rama Gardens, Menam and one of the Amari hotels, being airline crew. Awesome food all the same. Hi George, thank you very much, glad you enjoyed this recipe. You can typically ask for whatever type of meat you’d like with this dish, sometimes minced or pieces, it does go really well with minced meat as well! Haven’t tried this version yet but looking forward to it. I’m surprised you don’t use fish sauce. It’s in most Thai cooking I’m aware of and often either replaces or enhances the soy sauce. I am going to Bangkok in June. They are reputed to have the best in the country. That will be a good frame of reference. Hi Marc, thanks for reading this recipe. It depends, some recipes will use a bit of fish sauce, others will just use soy sauce like this to avoid the fishy taste with the holy basil. Hope you have a great upcoming trip! I have tried a couple of your recipes and found them easy to follow and delicious. I was so confident that I took three dishes to work for our nurses week celebration. I received many compliments. One of our Asian doctors tried the dishes and said they were very good! Thanks for sharing your knowledge it has helped me expand my culinary skills in a way I never thought possible! Hi Penny, that’s awesome to hear, thank you very much and glad the dishes you cooked turned out so well! Hey, just a quick one, and apologies if it’s already been asked! There are a lot of questions to read through! Could I also use dried Holy Basil for this, or is fresh the way forward? Hi Jordan, no worries. Best would be fresh if you can find it, but you could try dried if that’s all you can find. Thanks for your great website. I just tried your recipe of pad kra pao, adjusted it to my taste and loved it! I’ll keep making this one. I’ve blogged about it and referred to your website. Thanks again! Will be trying more of your recipes. Hi Frances, thank you very much, glad you enjoyed it. Great to see your blog post too, that looks delicious! I simply love this recipe in its originality, however I have made a few changes to it myself by adding satay paste, fish sauce, bamboo shoots and water chestnuts…it’s amazing!!! Thanks for the info, something to follow to make it my own!!! Hi, thank you for sharing, great to modify according to your taste, glad you enjoy it! You are very responsive to your readers, so I am hoping that you can clear my confusion. Some 20 years ago, I had a delicious Thai dish called “Mint Chicken” made with minced chicken and mint. It looked just like Basil Chicken, except the mint was quite identifiable. Mint chicken has been on the menu of many restaurants that I’ve tried since, but they always make it with basil. Is there such a dish made with actual mint, or was that somebody’s original dish? Why would basil be referred to as mint on so many menus? Is basil simply called mint when translated? Obviously, the dish made a big impression on me. Hi Nyna, good to hear from you. Hmm, usually the dish that included minced meat with mint would be a type of laab (also spelled larb https://www.eatingthaifood.com/2014/02/thai-larb-recipe/). Do you think it could have been that? Was it more of a salad, rather than a stir fried dish? When I first was introduced to Thai food in Southern California, some 30 years ago, I remember a restaurant making their pad grao pao with mint as well. I think it was more out of necessity (there was no place to get holy basil or “tulsi” back then) than it was a traditional dish. I can only assume the Thai owner was making do with what he could find! This recipe is a keeper! Had the dish in a small Thai place in Livermore, CA, and craved it ever since. Now I’ve made it four times at home since finding your recipe! It is delicious and oh, so easy to put together quickly! Thank you for posting, and I’ll have to check out more of your recipes soon! Hey Nancy, awesome to hear that, glad you enjoy this recipe! I found holy basil in Fry’s supermarket, and designed my dinner around it. I wanted to make pad kha pao gai for my friends, and I used your recipe as a guide and, success! My American friends said arroy mak! Saep! Great recipe, thanks! Hey Joe, awesome to hear that, glad you and your friends all enjoyed it! Hey Wayne, great to hear that, I agree, that holy basil really makes all the difference, it has such a wonderful flavor. Enjoy! 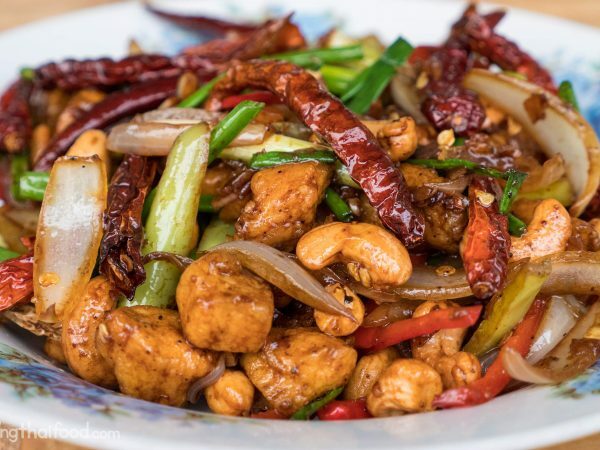 We used to live in Singapore it was there that we first discovered Thai Basil Chicken .We have been living in Dubai for two years now and have tried every Thai restaurant in search of the same dish with the exact delicious taste . Giving up I googled your recipe which is exactly the same authentic taste .Thank you, this has now become the new family favourite. Hey Santa, you’re welcome, glad you like it. Hey Bousso, thank you very much. Let me know how it goes! Hi Mark, that photo is absolutely gorgeous! I can’t wait to try this recipe, however before I go to the store to get my ingredients, can you explain the difference between light and dark soy sauce? I did some research on my own but I think it just confused me even more since there’s Japanese light and dark and Chinese light and dark, and they’re all different. What brands of soy sauce do you use and do you use Japanese or Chinese style soy sauce? Hey Flora, great to hear from you. For the light and dark soy sauce, usually the dark is just more strong and more salty, while the light is lighter in color and not quite as salty. But in this case, the dark soy sauce is also a little bit sweet. You could try a bit of Indonesian kecap manis – which is sweet dark soy sauce. Made this today with chicken thigh instead of breast. I did omit the thai chilli because I’m feeding the younger kids also. They love it. Thanks. Hey Jessie, glad you and your kids enjoyed it, thanks! Can I add Fish sauce? is fish sauce an option and is it in the original thai recipe? Hey Adeline, yes you can use fish sauce. Some people will use fish sauce, but other don’t want the fishy fragrance in the dish, but really it’s up to you. I always thought cooking this favourite dish of mine would be difficult. But you made it look so simple that it tasted great even on my first try!! Thank you so much for posting this video clip!! Super helpful! Hey Eslina, thank you very much, yah it rally quite easy to make and tastes great. Hope you enjoy it! I chanced upon this website over 1.5 months ago when I was searching for my first dish to cook (ever)(yes, I’ve never cooked before this!) and boy am I glad! I am Indian and a very dear Thai friend once introduced me to Pad Kra Pao and I have been a fan of this Thai dish since a long time; I would never miss the opportunity to eat it whether it be on my travels to Thailand or wherever I could find this dish. Surprisingly, the dish turned out to be exactly how I wanted it to taste and I was amazed by the clarity of the recipe! I love your website and plan to get my hands (and mouth) dirty with more delicious Thai dishes soon! Love the website, all its content, super-crisp photos and videos along with detailed out recipes! Keep posting! Oh delusion food my husband is he from thailand !but he never ate spiscy you are amizen???????? tried it…..ate it…..absolutely LOVED it!! Looking forward to trying more of your recipie’s! Hello Mark, this was great and very tasty. Could you potentially provide a recipe for chicken in pepper sauce as well. I assume it would be almost same, just use less chili and then add chrused black pepper to the sauce before adding it to the wok. Happy New Year! :) Just wanting to pick your brain a bit (apologies in advance). I live in Alaska… so fresh produce is very limited. It’s hard to find fresh basil, even more so for holy basil. Sometimes, the Asian market has the sweet Thai basil. However, I tried [loosely] following your Thai basil chicken recipe and it turned out great! I’ll be making it again tonight. The Asian market here doesn’t have a very large selection, so I’ll just have to deal with that. I usually have to work with standard “Kikkoman” soy sauce, whether it be light, low sodium, regular, etc… Fish sauce is typically “Viet Huong 3 Crabs Fish Sauce”.. I’m Korean, so I’m very unfamiliar with Thai and Vietnamese (my two favorites in Asian cuisine) cooking — ingredients and all. I’m trying to cook at home more and so I figured I oughta cook something yummy! I just got home from grocery shopping: garlic, ginger, onions, basil, soy sauce, fish sauce, hoisin sauce, sriracha sauce, and oyster sauce. So I’m hoping you can guide me in the right direction. All I know is that I’ve never had a Thai or Vietnamese dish I didn’t enjoy. (However, I do tend to play it safe by sticking to regular chicken, shrimp, pork, and beef). Keeping in mind that I’m limited on specific ingredients, any suggestions on something a beginner like me can do. Thoughts? Hey Stephanie, thank you very much for the comment, and I’m so happy to hear this recipe turned out so well for you. 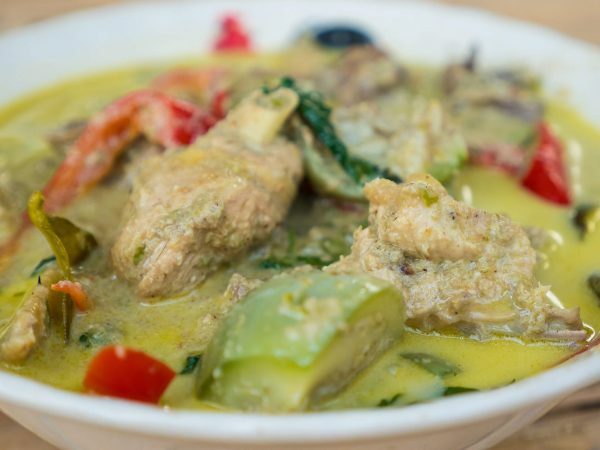 Sorry I’m late to help you with ideas of something to cook right now, but maybe in the future you could try some dishes like chicken with curry paste (https://www.eatingthaifood.com/2014/06/thai-gai-pad-prik-gaeng-recipe-%E0%B8%A7%E0%B8%B4%E0%B8%98%E0%B8%B5%E0%B8%97%E0%B8%B3-%E0%B9%84%E0%B8%81%E0%B9%88%E0%B8%9C%E0%B8%B1%E0%B8%94%E0%B8%9E%E0%B8%A3%E0%B8%B4%E0%B8%81%E0%B9%81%E0%B8%81/) or larb (https://www.eatingthaifood.com/2014/02/thai-larb-recipe/), which is a meat salad, very easy to make, and you can substitute pork for any kind of minced meat you like. Keep cooking Thai food, and thank you for stopping by! Thank you, Mark! I’ll try to Larb recipe since there’s some people (not me! — I love Thai curry!) in this household that seem to not like curry. Thanks Noraini, glad you enjoyed it! Cool to hear that, thanks Jayasen! Good for you doing what you love. Great job and explaining the real deals on what it really is. I’m a Database Admin sick of Corporate life and may chuck it all and come out to see you. Hey George, you’re welcome, thank you very much for your support! You should tell us what soy sauces your using like golden mountain and ect. I myself walk into the asian store and see many types of sauces. Especially when I want to make one of your recipes on the go I can’t decide on what soy sauce would work or not. Hey Monica, good to hear from you. Usually I think at our house in Thailand we use Golden Mountain or Healthy Boy. Happy cooking! Sound delicious and not that complicated to make. I shall try to do this in next two day. Thanks for that, Mark. Hey Jane, you’re welcome, hope you can try this recipe out! Does this recipe not call for any fish sauce? I find that most Thai dishes I’ve cooked have at least some of that. Hi Randy, this basil chicken recipe can be made with fish sauce or soy sauce, and it’s commonly made either way in Thailand. So it’s really up to your preference. Can’t wait to try this recipe! Always my Go-To at Thai Restaurants w/ground chicken! One question : I LOVE spicy everything but my daughter doesn’t . What’s the level of spiciness would you say this dish is? I would hate to leave out the chili as I know it contributes to so much flavor!! Hi Hollie, glad to hear you love Thai basil chicken as well, and with ground chicken it tastes amazing as well. For chilies, I would recommend at least 2 – 5, but even 1 would be alright, and she might be able to build her spice tolerance!? Hope your daughter enjoys it! Made this recipe several times now following your guide; a real winner – especially with Prik Nam Pla on the side. Goes so well with the egg. I’m lucky regards where I live; Manchester, UK. We have a great China Town and I can get fresh Holy Basil and lots of other fresh Thai ingredients. Can’t wait to be back in Bangkok – 4 long months to go…. Keep the great recipes coming. Hey Andy, great to hear you’ve enjoyed this recipe, and that you can get holy basil in your area. And good to hear you’ll be coming to Bangkok soon as well. Thanks for following! Thank you Mark for the recipe! I enjoyed cooking it (with mince pork). This is a favorite dish of mine & that includes the fried egg cooked the way you described. It really makes a difference :-) Two thumbs up!! Thank you for sharing Arthur, glad you enjoyed it. Yes, that egg! Can’t thank you enough for this fabulous recipe! I’m so proud of myself! And it was so easy! The success of this recipe has given me the confidence to explore other Thai recipes. This was so delicious, thanks again!!!! Will continue exploring your recipes! Hey Michelle, happy to hear enjoyed this pad kra pao recipe, thank you for sharing! This recipe is wonderful. I love this dish and have tried so many times to replicate it just by taste & feel. You nailed it! I’m so thankful to have found this site and I appreciate your kindness for sharing this with all of us Thai food lovers. I have perfected red, green, and panang curry, but this one edluded me until today. Thank you and God Bless you! Hey Cathy, great to hear from you, so glad you enjoy this recipe. This recipe is delicious! Unfortunately, I was not able to find either Thai sweet basil or Thai holy basil, so I used Italian sweet basil. Still delicious!! I tend to like my dishes saucier, so I doubled the sauce ingredients. Thanks for the recipe! Hey Libby, glad you enjoyed it, thank you for sharing. Sounds pretty good with Italian sweet basil! Hi Marc, tried this recipe tonight, it’s awesome! Will do it again, but this time I’ll add more basil! Thanks for sharing. Hi Gilliane, great to hear you enjoyed it. Yah, that basil really cooks down, so you can add a lot, enjoy! are there variations on the sauce ingredients? what about using fish sauce? thank you. Hi James, typically in Thailand soy sauce used in this recipe, but you could definitely substitute fish sauce for the light soy sauce. Hey Margaret, great to hear from you, hope you can try this recipe. Let me know how it goes! Looks yummy…. =-J I wanna try this! I love Thai’s foods! Awesome. So quick and absolutely delicious. Genius! Cool, glad you enjoyed it Time! So good I cooked it again tonight. Absolutely delicious! Yes, nice Tim, keep enjoying it! Thanks for the amazing recipe. I made this twice now and today my husband said the dish was stunning. I made it for 2 people so put 10 Thai chillies instead. Absolutely delicious, easy and very quick to make. Hey Sofia, great to hear you and your husband enjoyed it! I made this dish again a few days ago! I had to take the advantage of the fresh holy basil (weekly delivery from Thailand). The dish was spectacular. What amazes me is that it’s so easy to make and super delicious. Thank you again for sharing the recipe. Hi Sofia, good to hear you made this and got your shipment of holy basil. It really is so easy to make and tastes incredible! Will try to cook with the recipe you shared. Thank you for the recipe. Hi Mark, just wanted to say thank you for all of the passion you’ve put into this site and your recipes. I’ve made this recipe twice now, it is one of my favorites, and your rendition is excellent. I’ve only been able to make it with the fresh Thai Basil, Italian Sweet Basil, and Cayan Chilis we grow in our garden, but it’s still delicious. I’ve ordered seeds for several kinds of Thai Basil, including Holy Basil, and Thai Bird Chilis so we can grow the authentic ingredients. You’ve inspired us greatly, and pleased our palette more than you can know. So much so, I also bought a Thai sticky rice steamer, and this evening we’ll be making your Gai Yang, Pad See Ew, and sticky rice, Thai iced tea, with Mango sticky rice for dessert. If only we could find green papaya, we would be in heaven. Come on by if you like, there will be plenty of food! ???? Hey Theo, this is awesome, makes me so happy to read this, thank you for your kind and inspirational words, and I’m really glad you love Thai food as well. Thank you for the invitation for dinner, wish I could stop by to enjoy the feast. Let me know how everything turns out! Thank you for sharing Gabrielle, glad you enjoyed it, and sounds good with all the additions. Awesome recipe! I just totally impressed my (Thai) girlfriend with this, saying she couldn’t taste the difference with pad kra pao you get on the street or in restaurants. Fantastic Ter, glad you and your girlfriend enjoyed it! Awesome to hear that Salina, glad you liked it! Hi Mark, love this recipe, easy and delicious!! more thai cooking please! Thanks Wendy, more recipes coming soon! GREAT recipe! So incredibly easy and delicious!! Unfortunately I had to use “regular Thai” basil from my garden since I couldn’t find ghost basil but it still turned out better than any restaurant in town. THANK YOU and I look forward to trying out more of your recipes! Great to hear that Kira, thank you for sharing, glad it turned out well! I used sweet basil since I couldn’t find the kind you recommended and it was amazing, the egg took it to a whole different level of deliciousness! Thank you!!! Yes, great to hear that Shannon, I love the egg too! Hi Raisa, Thai green chilies will work well, otherwise you might try serrano peppers. Enjoy the cooking! Hi! I just made this for lunch.. and I am so in love with it. It is definately one of my very favourite dishes that I’ve cooked by myself. Thanks for sharing!!! I’m looking forward to cooking this many many more times. BTW I love your videos and your reactions!! Hey Ben, awesome to hear that, thank you! Thanks for posting this, I got back from Thailand just over a week ago and I’m missing the food already, this was a definite favorite! Can’t wait to make it tonight! Hey Leoni, you’re welcome, glad you enjoyed your time in Thailand. Enjoy the cooking! Hey Raph, you’re welcome, thank you for reading. Normally I use peanut oil, but lots of food vendors use soybean oil. GREAT! Had to substitute serrano chilis as my store was out of thai chilis and it was still great! Sounds great, glad you enjoyed it Kristine! This was absolutely delicious… Simple and delicious. Thank you! Thank you, Mike for giving me the chance to make some of my favorite foods (if I can find the ingredients locally! sigh…) we live in the very northwest corner of Georgia U.S. and it’s a nice change to find the recipes we get at our local Thai restaurant and be able to have them at home. If I make it well enough I’ll invite my family over and take some to my mom! Hi Jane, you’re very welcome. I hope you can find the ingredients and let me know how it turns out. Hey Mark, we enjoy all your recipe and your video, it’s really great! We add sometimes also green Thai beens and Thai Aubergines, but your recipe it’ the best! For to enjoy the food, it would be great to have the music at the background you have at the beginning and the end of your video. Who is doing that music, please can you provide it also? Hi Andrea, great to hear from you, glad you enjoy Thai chicken with basil as well. For the music in the video I used this song: http://www.audionetwork.com/production-music/opium_3956.aspx Enjoy! Oh my gosh, so happy to have found you/this site. I lived in Thailand many years, back 1, and am so missing Thai food. Wish I had kept a better list of my favorite recipes from my favorite vendors. I appreciate the Thai language for the titles! Really helps to make sure it IS the exact recipe I want. Hi Minnie, thank you very much, great to hear from you. Are you originally from Thailand? Yes, recipes from the people that sell them, are the best! Thank you Mark for this recipe. The description and the video made it easy to understand all the tips and the tricks. I made three variations of this recipe – using ground chicken, using eggplant, and using potatoes+paneer. All of them were a big hit with various members of the family. We discovered Thai Basil! You look like you enjoy cooking and your passion is helpful to the rest of us! BTW, I am not able to find the holy basil. I am resigned to just Thai Basil till the summer. Hello Jagadeesh, thank you very much for the kind words and glad you and your family enjoyed this recipe. Mmmmm, all of your variations sound delicious, I’m going to try making it with paneer too! Thank you again. Thank you MQ, glad you enjoyed this recipe. Thank you for your good job, sharing Thai recipes to others. I will try this Thai Basil chicken during my Christmas and new year vacation with my family in Manchester. I have once tasted it in Yangon, Myanmar while I visited my motherland and it was very tasty. Thai food are popular nowadays in Myanmar especially in Yangon and Mandalay. Great to hear from you Myint, hope you enjoy the recipes and hope you have a great Christmas and New Year! Mark, reading thru comments on your pad-kra-pao-gai recipe/video; I came across the Thia dish mentioned in Sid Dobson’s post 23Jan14 (pot nuah by ka praoh, pot pedt.) Some years ago I ate in a little local Thai restaurant in Philippines outside Clark Air Base (owed by a Thai wife married to a U.S. service man), I didn’t remember the name of the dish, but what Sid described sounds like it exactly. Thin sliced beef in a redish sauce cooked with lots of slices red chilies and basil. It was to die for. Any chance you could find and do this recipe for us??????? Love you recipes and videos. Keep up the good work. Hey, thank you so much for watching my video and reading this recipe. That dish sounds, maybe like beef pad prik pao, or pad phet, which would be been cooked in red roasted chili sauce. I’ll try and do a recipe like this in the future. Thanks for following. Hi Mark, great recipe!!! I love basil chicken and your version is top notch and very tasty. The only bad thing is I can’t get Thai holy basil here in Canada in the winter, so I have to use sweet basil. I was wondering from your experience if Thai chefs “treat” their meats like Chinese chefs do. You know the texture I’m talking about and have probably eaten tons of it, the meat being luxuriously soft and tender. I know of two methods, one being “velveting”, where you poach the beef or chicken quickly in either oil or water after marinating it in tapioca starch and egg white. After only a minute or so in barely simmering oil or water you remove it and then add it back to your stir fry later to finish. The second is to marinate the meat in a little baking soda and water, rinse and then either velvet or just use it as is. Both of these methods produce that extra soft texture we have all had in restaurants. You don’t mention treating your chicken in the basil chicken recipe, so I was wondering if you ever do that and if it is a common method at all over in Thailand. I happen to like that soft texture, but I know some people do not. I find chicken or beef definitely “tighter” without treating it first. What are your thoughts, and thanks again for an excellent post! Hi Neil, thank you very much, glad you like this recipe, and that’s a great question. Normally in Thailand, they do not treat or do anything to to the meat. Most of the time, they just stir fry it as is, sometimes they will fry it in oil first to give it a crispy edge, and then drain the oil, but most of the time they just stir fry it straight. I agree with you though, sometimes coated in cornstarch give the meat a soft velvety texture. Thanks for your recipe. I never eat this before but yours look really delicious and made me curious the taste and i tried your recipe. Yummmmyyyyy!!!! Look forward your another recipe. Great to hear that Sovi, glad you enjoyed it! You’re welcome Michelle. I’m so glad to hear you enjoyed this recipe. I just got a bunch of moopa (wild boar) and asked my friend what to do with it. and she said pad kra pao. So i googled for recepie and this is how i found you:). The holy basil do make the difference, sure:). But I raped your recipe a bit;). In the mix with garlic and chili I also added fresh green peppar (maybe does not go well with the chicken but beef or wild boar). Thank you for a lovely recipe and I will now study your website. When i looked at the video (which is great to look at to learn how to do) I was laughing out loud when I saw you where using the same frying pan and tools as I do:) It’s so much nicer to look at than the snobbish tv chefs. Hey, great to hear from you, that sounds delicious – and no problem about adding ingredients, I think that’s a great idea. Thanks for watching the recipe video and for the feedback – that’s exactly my goal, to just be as normal as possible! Damn near how Mom taught me! I make my pad kra pao kai with string beans for a crispy vegetable element. I also like to add red bell pepper in to the cooking for taste and color. I will finish it up with an edible garnish of julienne shallot. Oh and I’ll clue you in on the secret ingredient passed down to me from Ma, a nice heaping spoon of Por Kwan brand chili paste with sweet basil leaves. ;-) You’re welcome! Cool to hear that, thanks for sharing your extra ingredients! Great to hear that Peter, let me know how it goes. Enjoy! In Thailand they often use soybean oil. So I sometimes use that, but I also occasionally use peanut oil or rice bran oil. This is one of my favorite quickies! I use a ton of chilies (sometimes 20 or 30) because I’ve found the ones available in the Northwest aren’t always super hot. I’ve also discovered a good substitute for holy basil is regular Italian basil, plus a pinch or two of ground cloves! Hey Michael, thank you for leaving a comment. That sounds delicious, and great advice for a holy basil substitute. You are an awesome teacher. Thank you for sharing. Thank you for reading Stacey, glad you enjoyed this. Thanks for sharing the recipe with video. No problem Sue, glad it’s useful. How can I buy your thai cooking book ? Hey Hassan, I don’t have a recipe book yet, but hoping to make one in the future. I’ll keep everyone posted. Thank you. Hey Dan, great to hear from you, glad it was such a hit, those extra ingredients you added sound wonderful. Thanks again! You’re welcome, thank you Caroline. Delicious, what more can I say. I was lucky enough to purchase a Thai basil plant here in Spain and tried your recipe immediately. Made it foe me and hubby. Tonight I’ll be making it again for guests. I bought another plant as a gift for a friend and have sent her your recipe too. Hi Bibs, great to hear from you, glad you enjoyed this recipe, and thank you for sharing it as well. Awesome idea about the basil, not only do you have access, but right from the plant is the best taste. There’s a pretty big difference between the two, Thai sweet basil is more sweet and licorice-y, while holy basil is more peppery. However, if you can only get Thai sweet basil, it will still taste good, so I think you should still give it a try. Hope you enjoy it. thanks. The original recipes for red and green curry is the “Thai basil” or holy basil? You’re welcome Marcin. They normally put Thai basil in curries. Awesomeness! I love good Thai food. Thanks for showing me how to make one of my favorite dishes. I grow Thai basil every summer. I see much pad kra pao gai in my future. And pad see ew! Thanks. Its amazing how this dish work out so well for me. Well, just a bit too spicy for me! Ha! Other than tht, taste exactly like those I bought in a thai restaurant! Thank you! So cool to hear that, glad you enjoyed it! Great job Mark. I always thought Thai cooking was so difficult but you make it look so easy. Cant wait to try it. I look forward to more of your ideas & recipes. Many thanks! Thank you Greg, hope you can try this out! I was stationed in Thailand in 69 and 70 with the USAF. My favorite dish, if I remember correctly was (pot nuah by ka praoh, pot pedt.) I remember it as having only thin sliced beef, thai chili peppers, and lots of basil. It was extremely hot and delicious. In about a thousand(no exaggeration) visits to Thai restaurants all across the USA I’ve never found this duplicated. Lots of basil beef or basil chicken dishes and such are all that even come close but they always include bell peppers, onions and other vegetables. This recipe seems similar but with chicken. Hey Sid, thanks for sharing, that sounds delicious. Yah, I’ve tried to order pad kra pao in the US as well, and it always includes some different vegetables and often with sweet basil instead of holy basil. This is by far one of my favourite Thai dishes. I do like it with the ground chicken mince also……..and great with an egg and juuuuuust the right amount of runny yolk to mix in with the rice. Thanks Trent, glad you love it too. I agree, with minced meat, it’s awesome! Thanks for sharing your recipe for my all time favourite. I figured out that there are many different styles of pad kapao gai around in Thailand. Every single day in Thailand I eat at least one pad kapao – but every time in a different restaurant. And guess what – they are all different ! Haha, yes you’re absolutely right, there are many variations of pad kra pao by each food stall – the main thing that’s always consistent is the holy basil. Minced meat can be really good too. Glad to hear you cook Thai food frequently! Clear website, nicely written, beautifully illustrated, explanatory video … thank you for your time & effort !! Amazing recipe, I could almost smell and taste the succulent pad kra pao gai. You are doing an amazing job teaching Thai cooking, cant wait for some more killer recipes. Thank you very much Nash! Mark, That was a quick way of cooking one’s lunch or dinner. I have a problem here which is the holy basil – I don’t think I can find it in KL but I think I can replace it with curry-leaves ( the small leaves which Indians used it their curries). Will try it and let you know later! Thanks for sharing the recipe. In no time you will be a cook on Thai food….LOL! I’m actually not familiar with the flavor of Indian basil – not sure if I’ve ever eaten it. Is it slightly peppery, or kind of sweet in flavor? You can always give it a try and see how it tastes! Let me know how it goes! Hey John, good to hear from you. Hmm, never thought of curry leaves, though that might give it a unique twist. Enjoy! Thanks for this recipe – look forward to more to come. Have really appreciated your website, emails and ebooks – have learned so much about Thai food and cooking and discovered restaurants in Bangkok which, otherwise, I would have had no idea existed. Hey Denzil, no problem, thank you for all your support! Thanks Mike, enjoy the cooking class! I love pad kra pao gai! Thanks for posting the recipe! I have written to you a couple of times with several questions. I will ask here. I am having trouble finding lite soy. Please give me a brand name that i might find in an asian market in the US. I noticed in your basil chicken, that you do not use nam pla. most all of the recipes I have seen and use, use nam pla and palm sugar. please comment on the authenticity of this method. Hi Marc, sorry for not getting back to you sooner. In Thailand we often use a brand called Healthy Boy for soy sauce, which I think is available at Asian supermarkets in the US. Typically soy sauce is used, but fish is also sometimes used. As for palm sugar, you can use it or white sugar either way, but most people in Thailand these days use table sugar.